While trend drivers—including brand, specialty and generic price inflation—were similar to those in 2014, broad adoption of proactive CVS Caremark cost management strategies successfully mitigated their impact in 2015. Specialty pharmaceuticals continue to be a major driver of trend. * Growth rates for clients exceeded 30 percent in 2014. In 2015, due to our differentiated cost management approach, we were able to reduce the specialty rate of growth for our clients on average by more than one third. Price inflation was once again the primary driver of trend. Inflation in non-specialty brands far outweighed all other factors. This inflation impact is largely due to double-digit price increases for high-volume drugs in high-volume categories such as antidiabetics. Importantly, despite the launch of specialty blockbusters like Harvoni and increases in both price and utilization, specialty as a whole had less impact on trend than non-specialty brand inflation. The dominance of inflation as a trend driver underscores the importance of our intelligent purchasing strategies, a key part of our cost management approach. Intelligent purchasing begins with a strategic assessment of the market, including the pharmaceutical pipeline, clinical evidence and actions by other purchasers. The assessment helps us utilize market competition to obtain aggressive rebates and enables us to offer competitive pricing terms to our clients. More than 90 percent of our manufacturer contracts include price protection, a key element to protect our clients in a market characterized by excessive drug price increases. In addition, with generic dispensing rates above 80 percent, we saw a modest impact on trend due to generic inflation coming in at 0.7 percent in 2015. Our creation of Red Oak Sourcing, the largest generic sourcing entity in the U.S., in 2014 has proven to be a critical asset to help drive competitive generic pricing when your members utilize one of our pharmacy channels. The second leg of our approach is a range of versatile cost management strategies to manage product selection and utilization. These solutions, including formulary management and the use of narrow and preferred networks, enable clients to tailor their management approach, utilize targeted strategies and ensure that the right members get the right drug at the right price. With our real-time trend surveillance and dynamic management—the third leg of our cost management approach—we help clients anticipate and stay ahead of evolving market factors such as dramatic increases in price or utilization. In recent years, for example, the market experienced explosive growth in compounds. Our response included utilization management measures and cost limits for client adoption, resulting in $1 billion in savings across our commercial lives. In 2016 we will continue to focus on identifying key drug trend drivers in real time and quickly deliver flexible solutions to our clients to rapidly help mitigate predicted increases in our clients' pharmacy spend. Hyperinflation, increases of more than 100 percent and ranging up to 5,000 percent, generated headlines and a great deal of buzz although it affected a limited number of products and added under a percentage point to trend. These drastic price increases typically occur when the rights to a product are acquired by a new drug company. The new owner raises the product’s price, sometimes several times in a matter of months. For example, Glumetza, a branded form of the widely available generic antidiabetic drug metformin, was removed from our Standard Formulary several years ago. A review by our independent Pharmacy and Therapeutics Committee found that the drug added little value and was overly expensive. In 2015, the drug was acquired by Valeant Pharmaceuticals. Valeant raised the drug’s price twice in three months, a total increase of more than 800 percent. Clients who had adopted our Standard Formulary were protected from the impact of this hyperinflation and saved on average more than $700,000 per 100,000 lives in 2015. PMPM costs for Glumetza were nearly sixty cents less for clients aligned with our Standard Formulary. CVS Caremark has led the industry in formulary management offering clients a range of choices which deliver varying levels of savings. All our formulary offerings are based on careful clinical evaluation of therapeutic options and are designed to help deliver lowest net cost while helping ensure that members have access to the medications they need. On average, clients who adopted our most selective formulary, Value Formulary, in 2015 could have saved $20 million or more depending on the number of plan members they support. Recently published research from the CVS Health Research Institute demonstrated that selective formulary design has several effects. In terms of behavioral economics, it limits choice and reduces confusion, simplifying the process for members. Because selective formularies generally improve generic dispensing rates, they also make medication more affordable for members and result in improved adherence and member satisfaction. For the payor, the study shows that a selective formulary can lower medication costs by $20 per utilizing member per month. Payors face a highly volatile prescription market today, marked by an unprecedented level of drug price increases and a stream of high-cost new specialty launches. The double-digit drug trend we experienced in 2014 increased the sense of urgency among plan sponsors to implement programs and plan designs to mitigate growth in their benefit costs. The pharmacy management solutions they implemented in 2015 were effective. This result is gratifying, but market forces and trend drivers persist. We vigilantly monitor market developments, and our new interactive RxInsights trend surveillance tools help clients see the impact of market forces and cost management solutions in real time. In the coming weeks we will be launching our Dynamic Trend Manager, which will provide additional cost savings opportunities for clients while helping to improve the health of their plan members. *Prescription drug trend is the measure of growth in prescription spending per member per month (PMPM). Trend calculations take into account the effects of drug price, drug utilization and the mix of branded versus generic drugs as well as the positive effect of negotiated rebates on overall trend. The 2015 trend cohort represents CVS Caremark commercial clients—employers and health plans. 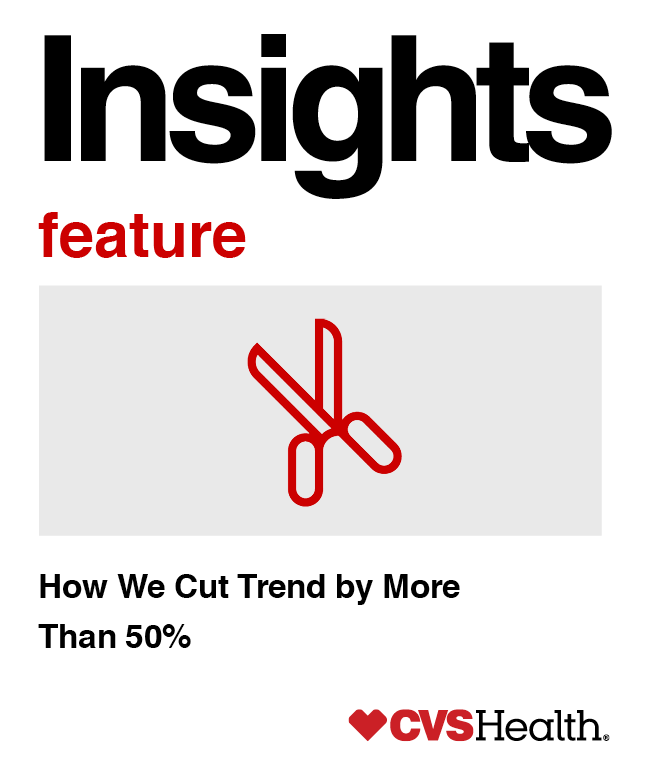 All of the savings and/or trend changes discussed in this Insights Feature will vary based on a variety of factors including demographics, plan design and programs adopted by the client.